So the first thing which is probably kind of obvious is painkillers. As soon as I start getting those headaches, aching legs and lower back ache, I'm reaching for the Ibuprofen. Well I like to use Nurofen because they just seems to work quicker and I want them cramps gone! or at least eased off a little. Next is something I've only just started to do probably over the past 3 or 4 months is to make a little treat bag/box. I know this may sound really silly and childish to some people but if it saves late night dashes to Sainsbury's because of cravings then I'm in! I tend to just buy a few things a few weeks before, here and there, when I'm doing online shopping or in store shopping. Then I put them away in a bag or box ready for it to arrive lol. I tend to buy a probably 3 or 4 treats anything from packet face masks, chocolate (obviously!) a new candle or book, lipstick etc. Just a few things to make me feel better. It's basically like those subscription boxes you can buy for the time of the month but you know what you're getting. Chocolate works wonders for me. I'm not just saying that either just so I can eat loads and not feel guilty when I'm on. Dark or milk chocolate, it doesn't matter. It helps. I've said this before on previous posts but if you're craving chocolate (or any other unhealthy things) then just have them. It won't make you gain 5 lbs overnight so stop worrying. If you're someone who really watches what they eat, then eat in small amounts. You shouldn't feel guilty about what foods you're eating when you uterus is basically having a full on tantrum for not being pregnant lol. Next is to have some Me Time. 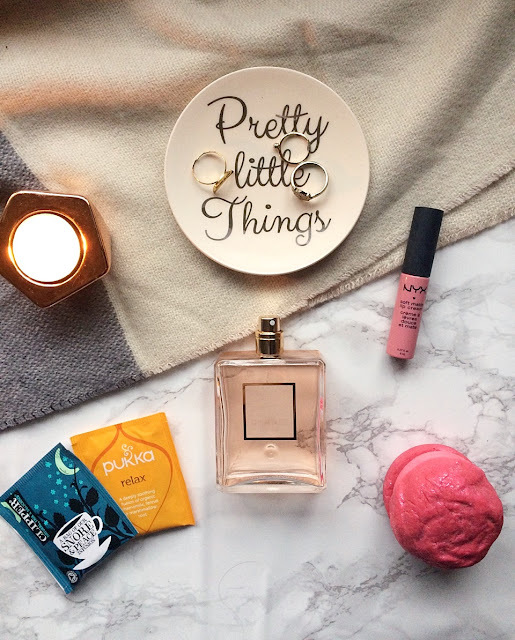 I love making a little playlist of my current fave songs and then running myself a bath full of bubbles (more than likely using some of my Lush goodies) and staying in there until my fingers go all wrinkly. Then afterwards I like making a big mug of hot chocolate, with cream and some marshmallows on top or just a nice, sweet cup of tea and then cuddling up in a blanket and read, catch up on TV or just watch something on Netflix. You may think I'm crazy but animals can help cramps. I'm not even kidding. I'm lucky that 2 of my cats like to snuggle up with you. (The other 2 are a little anti social tbh but I still love them equally obviously) They are basically like purring, furry hot water bottles and that's fine with me. Plus I read somewhere a while ago that a cat's purr can help pain or something like that?! Retail therapy. Yup. I tend to buy either products that I want to try or comfy tops or pyjama bottoms which is probably just because I'm on and and we all crave for comfort when we're on, right? Herbal tea is a life saver. I love the Pukka teas and the fact that they are travel friendly too. I also love peppermint tea when I'm suffering with cramps or sickness. It works wonders. Plus I find when the mood swings hit, herbal tea helps to relax my mind and just chill me out. Putting on make up even if I'm just planning on staying home all day. Whether it's a full face or just a minimal look, make up just makes me feel and look a little more better and it's takes my mind off the fact that I feel like Satan has possessed my uterus lol. Also wearing an uplifting scented perfume or my current fave scent helps too! So there's my tips for that time of the month. If you've got any tips to share then do comment below! I love a hot water bottle alongside feminax and chocolate! Good idea of creating your own box though!